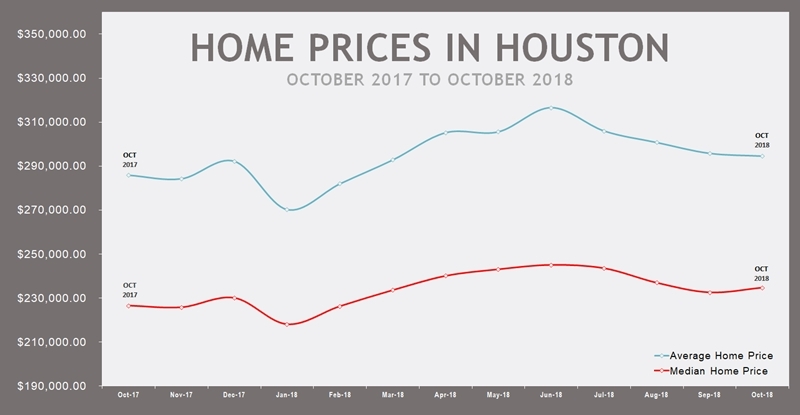 After a slow September, the October real estate market in Houston returned to the normal gains that we have grown to expect in 2018. Much of the drop in September was mostly influenced by the surge in post-Hurricane Harvey home sales in the previous September. According to the latest report from the Houston Association of Realtors (HAR), 6,716 single-family homes sold in October compared to 6,417 a year earlier for a 4.7-percent increase. Year-to-date, home sales are 5.3 percent ahead of 2017’s record volume. The single-family home median price rose 3.6 percent to $234,653, and the average price increased 3.5 percent to $294,500. Both represent the highest prices ever for an October. All housing segments experienced gains except for homes priced at $150,000 and below The strongest segment was the luxury market (homes priced at $750,000 and above), which jumped 12.0 percent in October. According to the Houston Association of Realtors, the 41,061 active listings in October 2018 represented a 7.3 percent increase from October 2017. Month-end pending sales for single-family homes totaled 7,039, a 5.4 percent increase over last year. Days on Market (DOM), or the number of days it took the average home to sell, improved to 57 compared to 61 a year earlier. Inventory registered a 3.9-months supply, up slightly from 3.7 months a year ago. The market continues to perform well across the entire region. However, there have been signs of the seasonal slow down that usually come with the holiday season. However, as the Houston economy continues to perform well, we do expect to see the usual bump in activity after the 1st of the year. Norhill Realty provides expert real estate services to residential buyers and sellers in Houston and surrounding communities. Contact us today for more information on Houston real estate and for professional assistance navigating this sometimes complex home market. Find and click your neighborhood below to find the latest listings for these great Houston neighborhoods. Norhill Realty and the MLS does not verify the information provided and disclaims any responsibility for its accuracy. All data is preliminary and subject to change. Twelve-month totals may vary from actual end-of-year figures, due to individual changes to MLS records. This data is for informational purposes only and should not be the sole piece of data used in the evaluation of a buy or sell decision. Consult with one of our Realtors to evaluate any particular property so you can determine how the market relates to that property.